Grade 5/6 students worked with Raine Hamilton 45 minutes a day for 5 days, and followed a creative process to write this song. The general steps are: Brainstorming, writing lyrics, refining, melody composing with xylophones or xylophone apps, rehearsing and recording. This school chose to focus on Water as a theme, which was a school-wide subject of study that year. The class continued their exploration by creating water colour paintings, depicted in this video with permission. Grade 1/2 students worked with Raine 45 minutes a day for 5 days. The students followed a creative process of brainstorming, writing lyrics, writing melody on xylophones, and then rehearsing, performing, and recording their song. 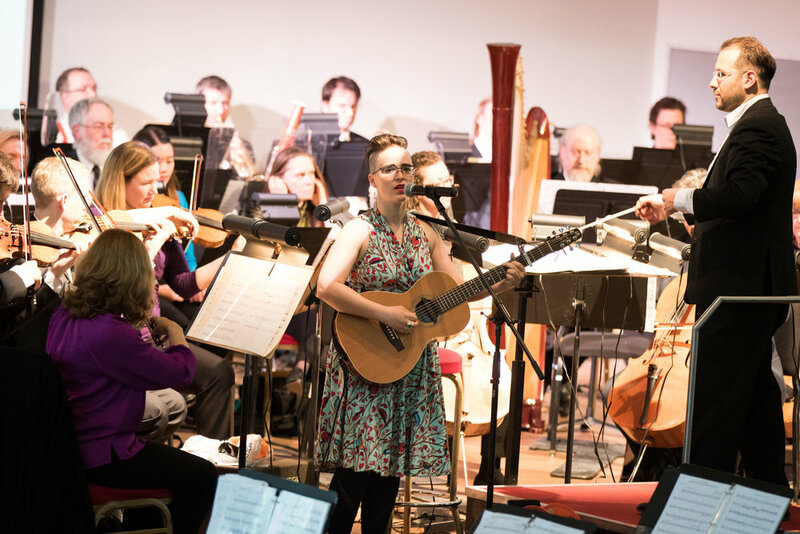 Performing with the Winnipeg Symphony Orchestra (Photo: Scott Campbell). Hi! 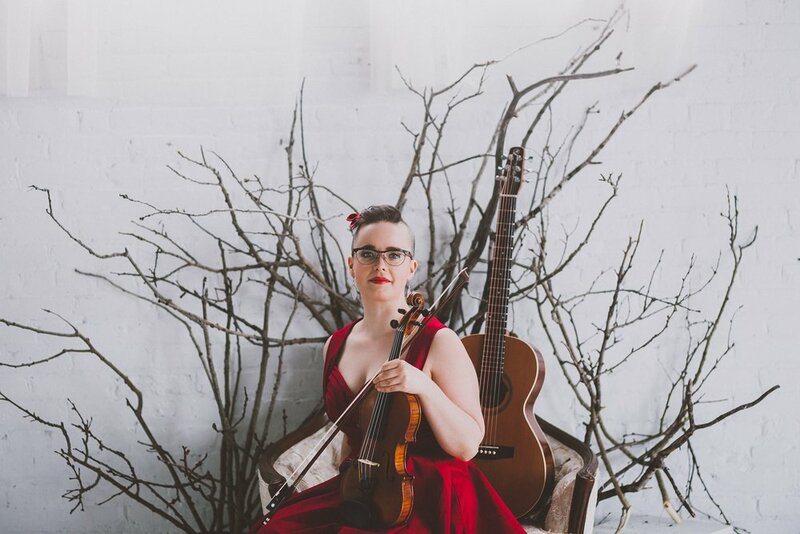 I'm Raine Hamilton, a bilingual (EN/FR) singer-songwriter and fiddle player / violinist based in Winnipeg Manitoba. I write for guitar and voice, as well as for violin/fiddle and voice. 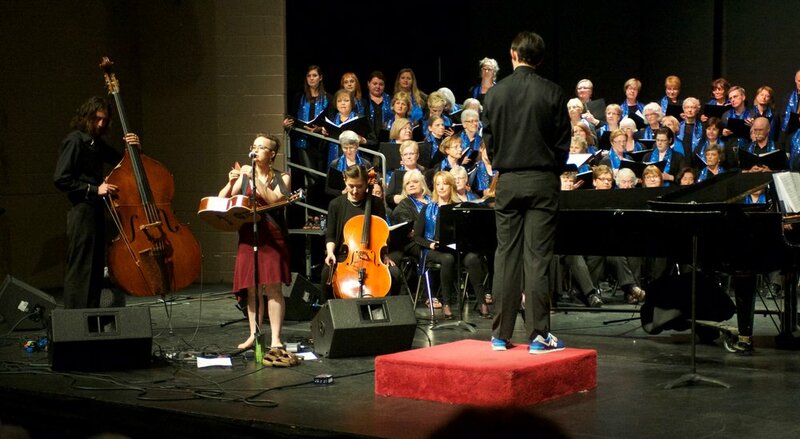 I have performed at music festivals across Canada, and I love working with young people. I am happy to offer two bilingual (EN/FR) programs with Artists in the Schools (AIS); a songwriting program, and a fiddle tune writing program. See my AIS Artist Directory PDF here. I am available to visit any school in Manitoba. I also offer these workshops outside of the Artists in the Schools Program - lets talk! I have 18 years experience working with young people, including 5 years working in schools, and two years with AIS. I was a fiddling instructor at Strathcona School (2011-13), and I was a violin instructor with the Sistema Winnipeg orchestra program at Elwick School, run by the Winnipeg Symphony Orchestra for 5 years. I was a Park Interpreter in the Whiteshell for 7 summers, and I love working with students. I believe that music is for everyone, and that we all have something to share. Find my full youth CV here. Copy of Co-operative musical chairs is so fun! Copy of Composing with notes and tab! "Raine is one of the most talented artist teachers I have worked with in my career." "I appreciated how calm she was and I could tell she loved her job. I also loved how whenever we were riled up we would play a game." "Raine's behavior management is top notch as she uses many strategies to keep young learners on task. It was a real pleasure having her work with my class!" " I worked with Raine for two years with grade 4, 5, 6 students. The kids loved her for her energy and cool things to share! When we did a composition project, her instructions were very easy to follow and it allowed every child to experience success. " What Is Artists In The Schools? Artists in the Schools is a program run by the Manitoba Arts Council (MAC). The deadline for schools to apply for this program for the 2018-19 school year is May 15th 2018. Program application with guidelines PDF here. The Artists in the Schools (AIS) program sends professional artists into Manitoba schools for one to ten week-long residencies (Monday-Friday). Artists offer specific workshops within their discipline, working with classroom-sized groups of students. It is so neat! Larger schools -one residency per grade level (K to 4, middle years, senior years). MAC shares the cost of the residency with the school. Each artist is paid a fee of $1,200 per week. MAC pays $750/wk (plus travel & accommodation) and the school pays $ 450/wk (plus material & equipment rental costs). More details here, on the Manitoba Arts Council site. My Program Description EN/FR: Raine Hamilton in the AIS Directory, PDF here. Complete AIS directory of all artists, PDF here. Grades K-12, 5 groups per week is ideal, 6 groups is possible. Available in English and in French. We can happily explore specific themes, and curricular links. It is best to have a theme selected before we begin. 1. Brainstorming: Collecting ideas on our theme. 2. Writing lyrics: Students study phrase construction, and write lyrics as a group, and as individuals (depending on age of students). a: Students compose melody using xylophones/metalophones or xylophone apps on devices. We study melodic construction, flow, contour, and word painting. b: OR, students compose music on garageband. 1 device with garageband for every 2 students is ideal. We study musical contrast, sections, texture, density, and tone. 5. Recording or Performance: Sometimes schools opt for an end-of-week performance, and others opt to spend the last day recording. Raine brings her H4 portable system and computer interface, and the students learn the basics of live recording. For any grade; Students must be able to play with 1, 2, 3 fingers on the A and E strings or more. 5 groups per week is ideal, 6 is possible. Available in English and in French. We can happily explore specific themes, and curricular links. SPECIAL REQUIREMENTS: One class set of fiddles; enough for all of the students in one group to have a fiddle. 1. Study Question/Answer form in an existing tune. We study phrases, home tone, the concept of tension and resolution, and the construction of Q/A tunes. 2. Write a Q/A tune as a class: Using handouts, rhythm cards, and clear steps, we write a tune as a class. 3. Students write their own Q/A tunes: Students follow the steps on their own. 4. Performance or Recording: Some schools opt to have an end-of-week assembly or in-class sharing. Others opt to record tunes; Raine brings in her H4 recorder, and the students learn the basics of live recording. Interested in having me work with students at your school? That's so great! Thank you :) The next step is for you and your school to apply to the Manitoba Arts Council. Applications must be post-marked or dropped off May 15th. 1. Contact me: raine@rainehamilton.com . Lets talk :) Are there themes, concepts, or curricular links that you are interested in exploring? We have some forms to fill out together. 2. Please fill out this Letter of Understanding form. This shows that we have talked and have a plan. 3. Please fill out this AIS Residency Application and Guidelines form. 4. Mail or drop off the Application Form and Letter of Understanding by May 15th. 5. The Manitoba Arts Council will look over all the forms, and we wait to hear back. Detailed information on the application process available on the Manitoba Arts Council site. Thank you! It is an honour to work with you and the young people you teach.